The Pagel Family has been in Texas since 1850 when Gottfried and Friedrike Pagel and their family of eight children emigrated from Germany. Their home had been the village of Kortenhagen in the province of Pommern (or Pomerania). Gottfried Pagel was born in Pommern on January 1, 1800 and worked as an innkeeper. He married Friedrike Dieckow who was born in about 1810. The first of their children arrived June 13, 1834 and seven more were born in the vicinity of Kortenhagen. On September 2, 1850 the family, including four-month-old Ernst Pagel, boarded the "Bessilian" [also referred to as the "Brasilian" in some records] in Hamburg. (The Pagels might have traveled there from nearby Stettin either by train or by an Oder River boat. The train tracks were completed in 1850, but train travel may have been too expensive. They may also have traveled by carriage.) Ship records indicate Gottfried's occupation as "carpenter." The family landed at Galveston, Texas and then traveled to southeastern Fayette County where they settled in the small, predominantly German-speaking community of Willow Springs. In January 1852, Gottfried Pagel bought 144 acres out of the Miles League on Cummins Creek from F.E. Harwell and wife. He is listed on the 1851 Fayette County tax rolls as owning 144 acres worth $288, two horses worth $50, and a wagon and oxen worth $65. In February 1853 he bought an additional forty-eight acres to farm on the east bank of Cummins Creek from N. B. Breeding for ninety dollars. In April of that same year his last child, Julius, was born. 1. Friedrich "Wilhelm" (William) (13 June 1834 - 21 October 1873) who married Magdalena Fritsche and farmed at Willow Springs in Fayette County where he was also a merchant and postmaster. 2. Carl Friedrich (Charles) (3 May 1836 - 14 December 1903) who married Johanna Furchtegott Kuehne and became a successful farmer and rancher north of Hallettsville in Lavaca County. 3. August (25 February 1838 - 21 January 1915) who married Louisa Spieckermann and lived in Lavaca and Jackson Counties. He was a farmer and ran a grist mill. 4. Caroline "Wilhelmina" (Minna) (20 February 1840 - 28 November 1936) who married Carl "Friedrich" Fischer, a Colorado County farmer. They lived near Frelsburg. 5. 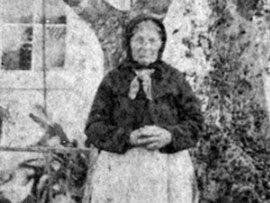 Louise "Fredericka" (31 December 1841 - 2 November 1929) who married Frederick (Fritz) Ladewig and farmed near Breslau in Lavaca County. 6. Friedrich Samuel (Fritz) (28 December 1844 - 30 November 1887) who married Helena Fehrenkamp and farmed near Breslau in Lavaca County. 7. Emilie (6 April 1848 - 24 December 1912) who married William Appelt a wealthy Lavaca County farmer, rancher, and merchant. After Appelt died, she married Fredric "William" Schott just two years before her own death. 8. Ernst Franz (12 April 1850 - 7 April 1939) who married Annie Appelt and farmed in Lavaca County and later at Tivoli in Refugio County. 9. Herman "Julius" ( 18 April 1853 - 19 March 1928) who married Anna Rother. They farmed in Lavaca and Jackson Counties, and briefly in Kendall County. Friedrike Pagel died soon after Julius' birth and is buried in an unmarked grave near Willow Springs. On April 15, 1855 Gottfried Pagel married Johanna Zorn Fritsche at Industry in neighboring Austin County. Johanna (or Anna) was a recent Wendish emigrant from Friederichsdorf in Lusatia. Newly widowed, she had one daughter, Magdalena, who later married Gottfried's son, Wilhelm. Gottfried Pagel applied to become a naturalized U.S. Citizen in La Grange District Court on October 15, 1856. By 1857 his personal property in Fayette County had grown to include eight horses and fifty cattle. However, in January 1858 he bought 110 acres in the Sherrill League in Lavaca County from Jacob Woodward for $190 and he, Anna, and all of his children (except Wilhelm and Minna who had already married) moved just south of Hallettsville where they founded what was called the Pagel Settlement. In June of that year he bought 547 additional acres from Woodward for $2200. In October 1859 he sold 229 acres of his land in Lavaca County to his son Charles. His will shows that he expected his sons to farm with him until they were twenty-two years old. Gottfried bought 200 more acres nearby in February 1860 from Gabriel and Eleanor Zumwalt for $500. It was in July of that year that Gottfried Pagel became an American citizen. In June 1867 he sold all his land in Fayette County to Wilhelm for $1900. Gottfried and Johanna lived at Pagel Settlement until his death on August 8, 1873 at age 73. He was buried in the Pagel Settlement Cemetery, his grave enclosed with an iron fence. His wife moved back to Fayette County to live with her daughter. Friedrich Wilhelm Pagel died only two months later, so Anna helped raise Magdalena's young family. Magdalena died on July 13, 1886 and her house and part of her property was bought by Ernst Albrecht, the husband of her oldest daughter, Emma. Johanna Pagel lived the remainder of her long life with the Albrechts at Willow Springs. According to census records, she never learned to speak, read or write in English. She died on February 6, 1904, just four days short of her ninety-fourth birthday, and was buried at the Pagel Cemetery near Willow Springs.